When it comes to plumbing problems, a damaged sewer line is up there with the top plumbing problems to want to avoid. Regular plumbing maintenance can help prevent a damaged sewer line, however sometimes things our out of our control, like shifting ground. That is why it is important to be able to recognize the signs of a damaged sewer line. Here is what to look out for. A sewage backup is a nasty problem. Not only can it create a huge mess and a lot of damage, but it also creates a health hazard. If it is a localized problem, unclogging the drain should do the trick. However, if more than one drain is clogging at the same time, it could be a sign of a damaged sewer line. In addition, if you continually suffer from back sewage backups, even after drain cleaning, this is another indication of a damaged sewer line. Much like sewage backups, slow drainage can also be another indicator of a damaged sewer line. Again if only one drain is suffering, it is likely isolated to that one drain. However, if you notice multiple drains with drainage issues, then it could be from a damaged sewer line. Sewer gas naturally has an unpleasant odor. Most of the time, our plumbing systems do a good job at preventing them from entering our homes. However, these systems can sometimes fail. A lot of the time, infiltrating sewer gas is the result of a tried trap. Simply running the water should alleviate the problem. However, if it doesn’t do the trick there could be a more serious problem at hand, including a damaged sewer line. In addition to the smell of sewer gas, another smell associated with a damaged sewer line is the smell of mold. Mold has a very distinct smell, reminiscent of wet soil. If you notice a musty, mildew smell, you can have a sewer leak. Undetected leaks often cause a lot of damage, including mold. One way unwanted house guests like rodents and other vermin can gain access into your home is through a damaged sewer line. Cracks in a sewer line provide the perfect opportunity for rats and bugs like cockroaches to enter into your home. A pest problem is a serious problem. 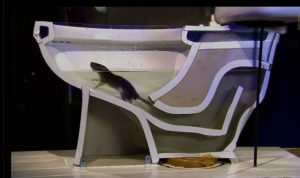 There are many health risks associated with rat and cockroach infestations. A damaged sewer line provide a lot of extra fertilizer for grass to flourish. One sign there may be a sewage leak, it extra green lush patches of grass. Also an unexplained puddle of water or sewage, if a tell tale sign of a leak. If a sewer leak occurs under your slab and goes undetected, it could cause shifting in the foundation. This can result in foundation cracks, settlement, and even a sinkhole. 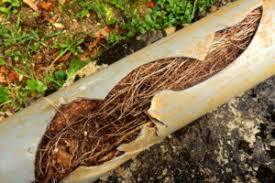 A damaged sewer line can occur for a variety of reasons. It could be from the ground shifting, from heavy rain, corrosion, or even construction damage, just to name a few. If you suspect a damaged sewer line, it is important to take proactive steps to prevent excess damage. Call your plumber right away to properly diagnose the problem and make repairs. To learn more contact Rooter Hero today!